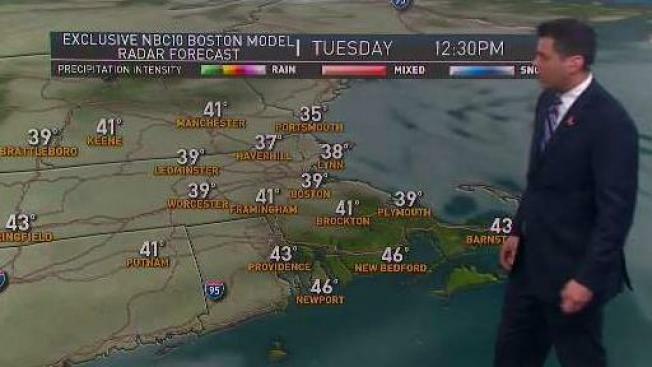 Gloomy Opening Day, But Will it Rain on Red Sox Game? Low pressure that dropped more than a half a foot of snow in Maine has moved east Tuesday morning. Now, we have a little gap with drier air before the next low-pressure system moves in late Tuesday. A front that separated the 30s, 40s, and 50s in New England from 70s and 80s in New York and Pennsylvania Monday has slipped a little further south Tuesday. So we are mostly on the cold side of the front. We may make it to 50 degrees Tuesday in areas where sunshine can break through. But for most of us, the temperature is closer to 40 degrees for a high on Tuesday as clouds fill back in and thicken in the afternoon. Another wave of low pressure crosses New England, very similar to the one that we had Monday. Rain and snow should be arriving in western New England late Tuesday afternoon, and snow may accumulate in much of Vermont, New Hampshire, and Maine Tuesday night. Before the precipitation arrives though, we should get a baseball game in at Fenway Park. Likely about 43 degrees and cloudy in Boston, with light wind off the ocean. The precipitation probably arrives in the Boston area about 5 or 6 p.m. As the night goes on, the temperature once again falls through the 30s, with the rain-snow line moving south into northern Massachusetts before ending early Wednesday morning. But we are not expecting any accumulation of snow in southern New England. Tuesday night's low-pressure system also continues east with a few sunny breaks developing Wednesday. But the air will be unstable and we have chances for rain or snow showers just about anywhere most of the day. High temperatures again in the low to mid-40s. Cold and dry high-pressure comes in Wednesday night, leaving us with plenty of sunshine for Thursday. With that sun, we should be able to get back into the 50s after a subfreezing start. As we dry out Thursday, we look west at a major storm crossing the middle of the nation, with heavy snow, perhaps a blizzard on the northwest side, and a severe weather outbreak along the Mississippi River. That storm arrives in New England later Friday. At this time, it looks like the storm tracks to our northwest, putting us on the warmer side with mostly rain coming in late Friday and Friday night. We may even have a squall line with thunderstorms. That storm moves out for a pretty nice weekend. Then we are on the cooler side of the front. We should be sunny and that gets most of us to get near 60 degrees on Saturday. Probably a little cooler and still bright Sunday. The early outlook for Marathon Monday in Boston, another coastal storm may run up the eastern seaboard, with a chance of rain and snow developing here Sunday night into Monday. Keep ahead of it with our First Alert 10 Day Forecast.